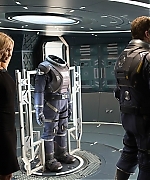 Thanks to Mouza at Chris Pratt Fan, I was able to add new stuff the the Passengers section in the gallery. Don’t you just hate it when you wake up 90 years too early from suspended animation and realise you’re on a spaceship, but the rest of the 5000 passengers are still safely sleeping? 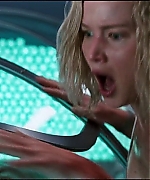 Well, that’s exactly what happens to Jennifer Lawrence and Chris Pratt in their new movie, Passengers, and judging by the trailer things are about to go from bad to worse. 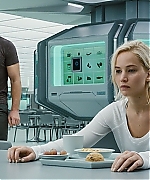 JLaw and Chris wake up on the spaceship, Starship Avalon, on its 120-year voyage to a distant colony planet known as ‘Homestead II’. 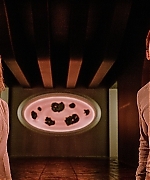 The ship has a malfunction in two of its sleep chambers and as a result, two hibernation pods open prematurely and the two people that awoke are husband and wife Aurora and Jim Preston, who are stranded on the spaceship, still 90 years from their destination.As the only two people awake they try and make the best of the situation by doing normal things like going to work and having date nights. 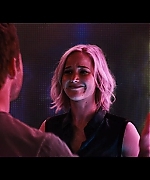 In one scene, Jen is seeing unable to contain herself, and her emotions, as she clambers over a dinner table and throws herself onto her husband as they share a passionate kiss. 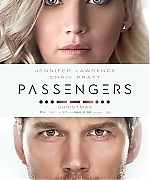 I added additional promotional pics and 1 poster of Jennifer’s upcoming movie “Passengers” to the gallery. 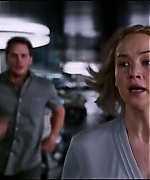 Thanks to Mouza from Chris Pratt Fan, I was able to add the promotional images from ‘Passengers’ in HQ to the gallery. 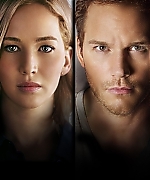 Make sure you check out Chris Pratt Fan and the new additions in the gallery. 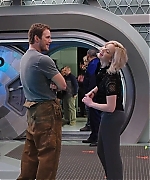 We’ve been hearing about Jennifer Lawrence and Chris Pratt’s sci-fi drama, Passengers, for a year and a half and now, after months and months of waiting, the first pictures from the film have finally been released. Until now, we knew very little about the movie, aside from the cast and a brief description of the plot. 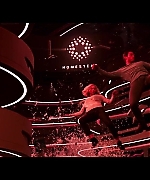 In Passengers, Lawrence and Pratt play the only two people awake on a space craft, where 5,000 other passengers are sleeping in suspended animation—but then the ship starts to malfunction (because of course it does) and they have to save the day, the 5,000 sleeping people and themselves. 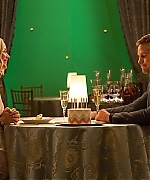 Entertainment Weekly premiered two images from the upcoming film, and we’re more excited than ever to see it. TBH, they had us at Jennifer Lawrence and Chris Pratt, but these new pictures have us very intrigued. 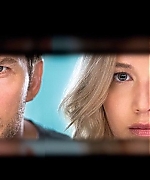 In the first, Pratt and Lawrence look through an opening of some kind. What are they staring at? We can’t be sure, but we definitely want to find out. There’s no doubt Jennifer Lawrence looked as glamorous as ever on Tuesday as she promoted her upcoming movie Passengers. The 25-year-old Oscar-winner oozed confidence as she posed backstage at the event. An embellished paneled skirt and beaded strappy heels added a boho touch to her look and she wore her lightened locks pinned back off her face. During the night she teamed up with her Passengers co-star Chris Pratt as the duo talked enthusiastically about the sci-fi adventure flick which is set for release in December.